Help using "Find on this Page"
The "Find on this page" search tool is designed to assist in finding a word or phrase on a Web page. This tool will only search the current Web page. A word or phrase may be used as the search term, however only exact character matches will be found. For instance, searching for "children" will not find "child", however searching for "follow" will find "follows" or "followed" as the complete search term is in both words. Using "Find on this page..."
Select the "Find on this page..." button to be presented with the "Find Window" search box. Enter the word or phrase to be searched into the "Type in text to find:" field, and select the "Find Next" button. The cursor will move to the first instance of the word or phrase, and the number of instances found will be indicated at the bottom of the search box. Additionally, each instance of the word or phrase entered in the search box will be highlighted throughout the Web page. Continue to select the "Find Next" button to move to the next instance of the word or phrase. You may also use the "Find Prev" button to move to the previous instance of the word or phrase. To search for another word or phrase while keeping the previous search term highlighted on the Web page, enter a new word or phrase in the search box and select the "Find Next" button. To clear all search results and begin a new search, select the "Clear Search Results" button, and begin the process again. 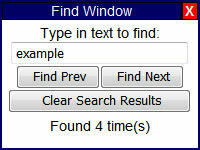 To close the "Find Window" search box, select the "X" in the upper right corner of the search box. In addition, selecting the "Clear Search Results" button will also close the "Find Window" search box.